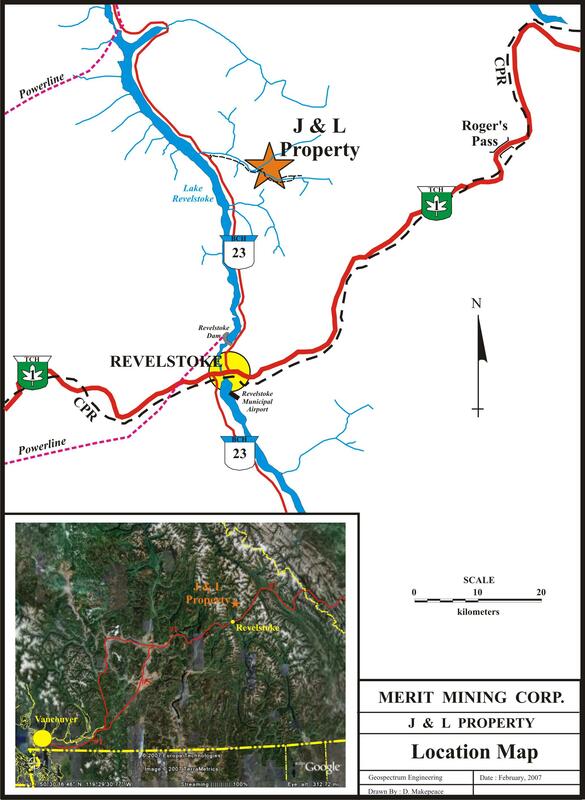 The J&L Property is located 35 km north of Revelstoke in British Columbia, Canada. The property consists of 20 mineral tenure claims and 10 crown granted claims for a total of 3,051.73 ha. It has been explored intermittently during the 20th century by a number of operators. In total, 311 drill holes (40,886 m) have been completed, together with about 3 km of underground development. 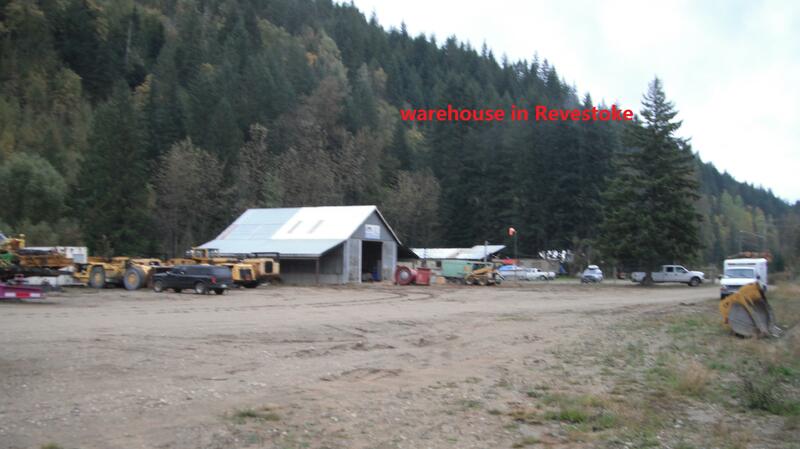 In 2010, a 100% unencumbered interest in the property was acquired by Huakan (formerly, Merit Mining Corp.) after making payments totaling $10.79 million. 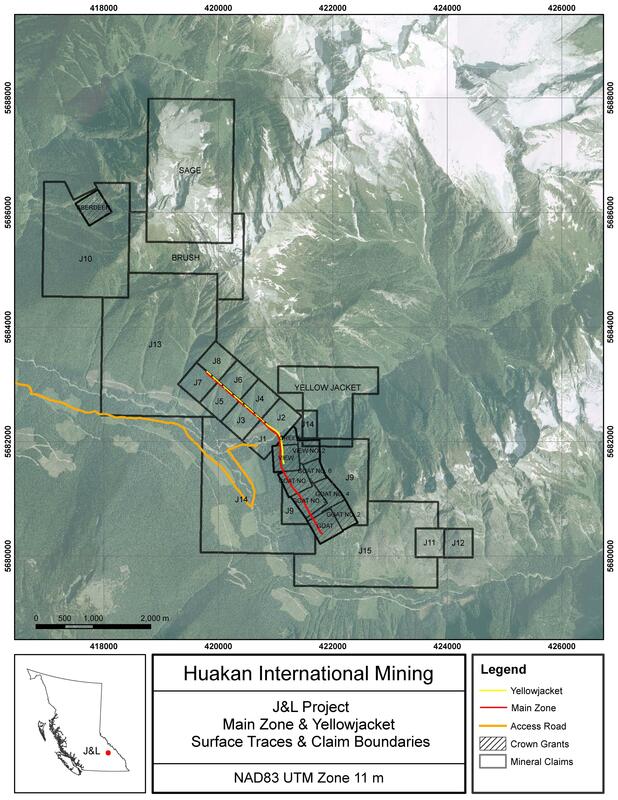 Huakan completed extensive drilling and drifting on the property, advancing it to the point of a Preliminary Economic Assessment (“PEA”) in 2012; however, in 2014 further work ceased due to deteriorating market conditions in the metal sector. 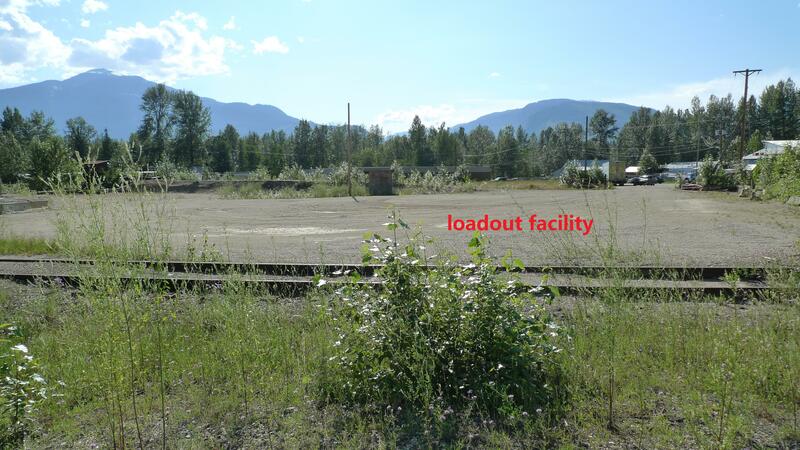 The J&L Property has well-established road access via paved highways and forestry roads; it has an easy access to railroad, with a 100%-owned rail siding and load-out facility in Revelstoke. 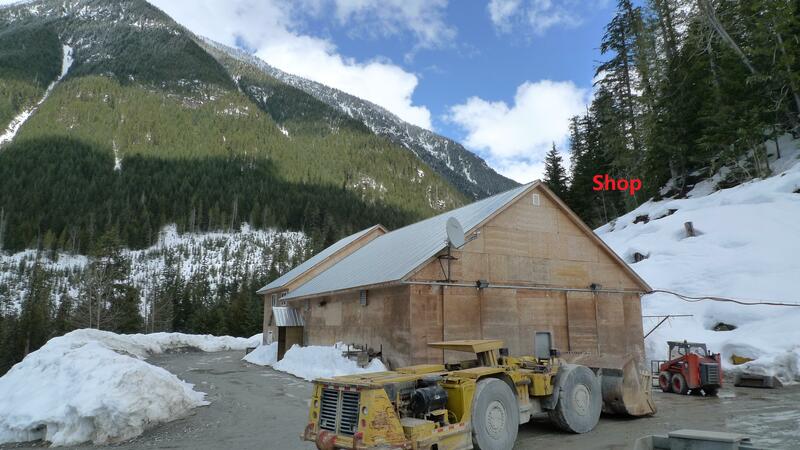 The power source could be provided by transmission from Revelstoke and Mica Major hydro-generation facilities. 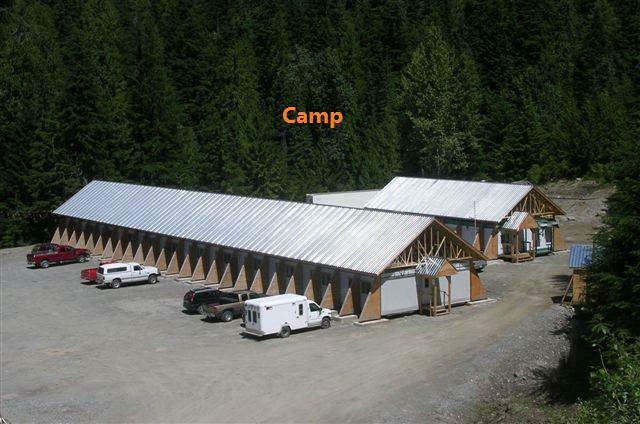 The Property infrastructure includes mine buildings (40-person camp, maintenance buildings and workshops) and an underground mining equipment fleet. 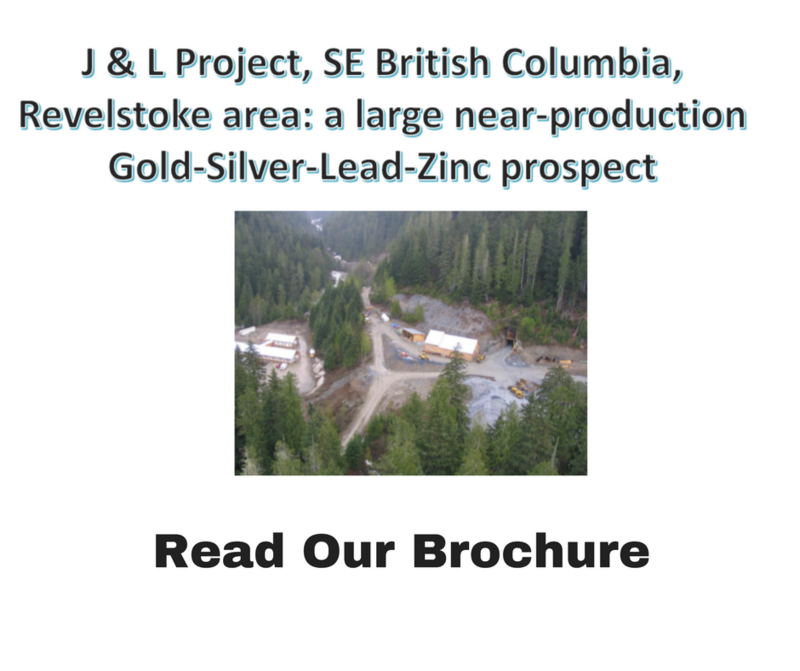 The J&L Property incorporates several paralleling to en-echelon, shear-hosted, replacement-style, 2-3 m to 15 m wide, moderately-dipping (55o), gold-silver-lead-zinc-bearing sulfide-rich mineralized zones, which are considered to possibly be of the distal intrusion-related style. Main sulfide minerals include pyrite, arsenopyrite, galena, bournonite, freibergite, sphalerite, and chalcopyrite. 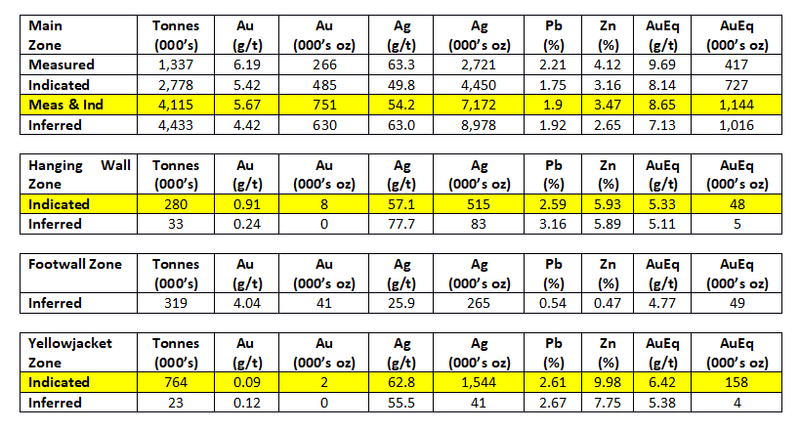 Both sulfide-related (refractory) and native (free) gold are present. The drilled extent of the mineralized zones is up to 1.5 km along strike and up to 0.85 km downdip; they remain open for further expansion. The largest known mineralized zones include the Main, Footwall and Yellowjacket Zones; the Main Zone was traced up to 3 km along strike on surface. Historic Mineral Resource Estimate for the J&L Property. In 2010, Merit/Huakan commenced a 2,000 m underground drill program with the objectives of verifying historic drilling and broadening the Main Zone resource. The program was expanded to 7,897 m with the completion of 60 cored holes by February, 2011. In 2012, Merit drilled an additional 45 underground holes, and then further expanded the program by completing the Phase 2 exploration, with an additional 6,700 m of drilling from underground. Huakan also initiated metallurgical testing on drill core samples, including heavy media separation, grinding, several stages of flotation and pressure oxidation, and bioleaching on a portion of the flotation products prior to cyanidation. Subsequently, as a result of its Phase 2 exploration, a mineral resource estimate was announced in a news release by Huakan dated September 18, 2012, which included the Main, Footwall and Yellowjacket Zones. This estimate was restated by Huakan in a later news release dated January 21, 2014. The historic mineral resource estimate presented above is taken from a Huakan news release dated January 21, 2014. The estimate is reported herein as historical resources in accordance with the requirements of NI 43-101, as these resources were prepared before Golden Dawn entered into this agreement to acquire an interest in the property that contains the deposit. 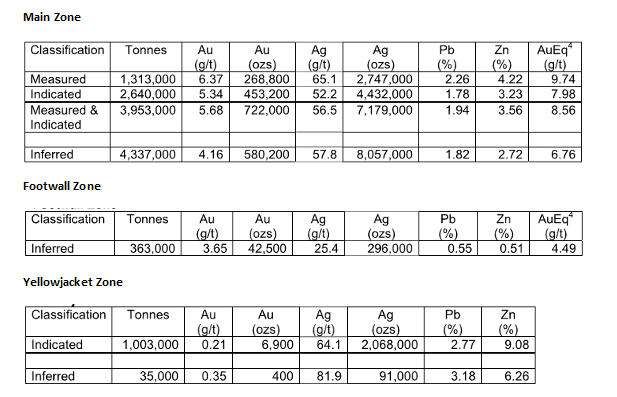 Updated Mineral Resource Estimate has been completed for the J&L Project, with 1.35 million gold equivalent ounces in the Measured and Indicated categories and 1.08 million gold equivalent ounces in the Inferred category (details in table below). 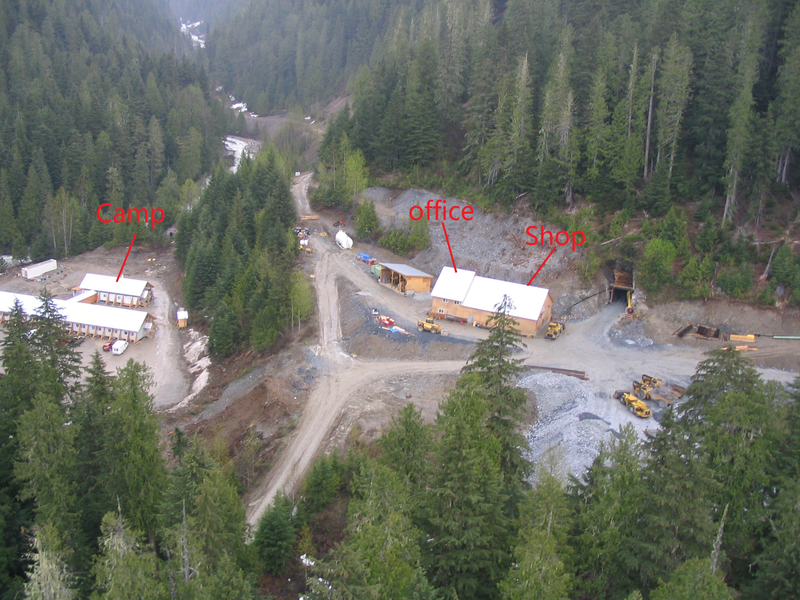 J&L is therefore one of the largest undeveloped gold Mineral Resources in western Canada. – Mass pull of 5% and 8% concentrate moisture content. 5. The NSR cut-off of CDN$110 per tonne was derived from $75/t mining, $25/t processing and $10/t G&A. The Mineral Resource Estimate was undertaken by P&E Mining Consultants Inc., who will complete a Technical Report for Golden Dawn within 45 days of this news release. The updated Mineral Resource Estimate includes the Main, Yellowjacket, Hanging Wall (HW) and Footwall (FW) Zones. The most significant are the Main, Footwall and Yellowjacket Zones. The Main Zone extends over 3 km on surface and has been drill-defined over 1.5 km along strike and 850 m down dip and remains open for expansion. In general, the zones consist of gold-silver-lead-zinc-bearing sulfides. Golden Dawn will also proceed with a Preliminary Economic Assessment (PEA) to fulfil the first phase of the terms of its option agreement. It is expected that the PEA will incorporate results of advanced metallurgical studies and will investigate opportunities for pre-concentration and processing on and off-site. The PEA is expected to be completed within 5 to 8 months, with costs estimated at $250,000, including project expenditures. The Company has no further significant obligations under the terms of the option agreement until a decision is made to proceed with a Pre-Feasibility Study. Golden Dawn intends to manage the J&L Project on a stand-alone basis and finance it on the foundation of an economically robust Pre-Feasibility Study.